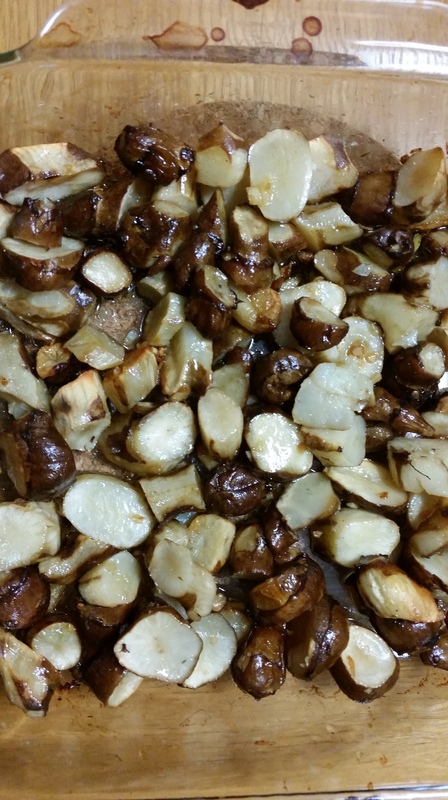 I got a quart of Jerusalem artichokes (Helianthus tuberosus),as a special bonus from the farm the other day and I was thrilled to get to try them. 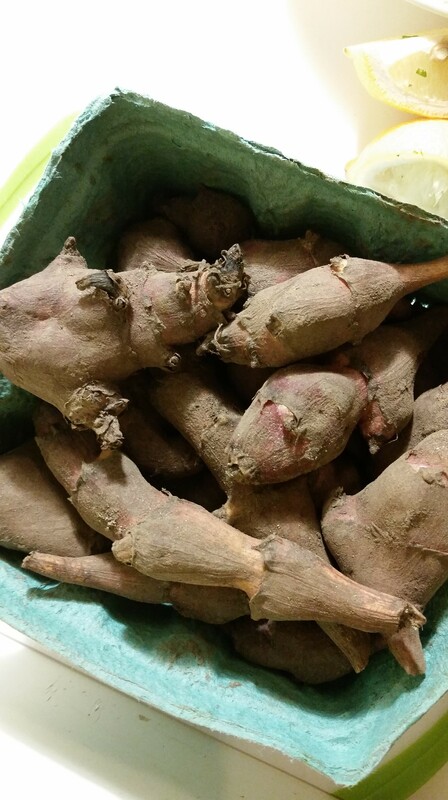 But a funny thing happened when I began to research…some articles suggested that as delicious as these roots are — favored by Native Americans back in the day and now beloved worldwide — and despite their cheery aliases — sunchokes, sunroot and earth apples — they have a dark underbelly. Emphasis on belly. The story goes that they cause gastric disturbances that no one wants to talk about, since they have so many tasty uses and currently are the darling of the foodie-rootsy set. I took my investigation international, as my sources said the Brits in particular complained about the gas and christened them “fartichokes.” Given that the English would be unlikely to worry about the truth of such a terrific pun-type word and would happily use it with complete disregard to its relationship to actual fact, I had to corroborate. My son and I got on the Skype to Lowestoft, England to ask my friend Kate and her two boys, Alastair and Gregor, who are 10 and therefore can be expected to be well-versed in anything gassy. They said no, they’d never heard such a thing, but seemed to enjoy being asked. Well, me being me, I forged on with the experiment, fearlessly offering my body as laboratory rat in the name of good eating, washing and peeling some (but not all) of these cute little roots that have a hobbit-y sort of charm. I set about roasting and then had a taste. They were delicious. Really delicious. Firm to the bite then creamy inside, with a wonderful nutty flavor (the peeled bits were better than the unpeeled); I was smitten and already thinking about what I could do with them the next time. I then went to bed, after leaving some for my parents to try with their lunch the next day. It’s a good thing I drive alone to work. 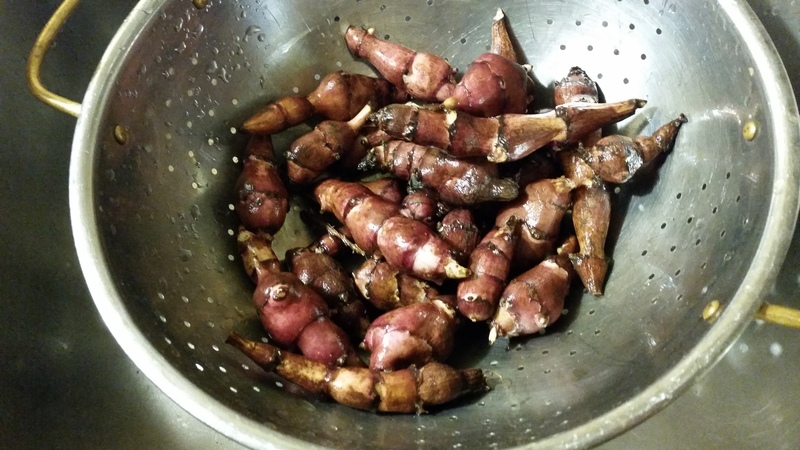 It is also a good thing that I was able to reach my parents and warn them off before they had a go at the Jerusalem artichokes. I did not, of course, call them while driving. I was too busy rolling down the windows and trying to breathe. Now of course I had to repeat the experiment, just to be sure. I tried them again a couple of days later. Same filthy loathsome stinking result. Having said that, it may not be the same for everyone; some people think cilantro tastes like soap while others think it is the best herb ever. Not everyone gets the funny pee smell that many others do after eating asparagus (I won’t tell you which category I fall into, as I have shared enough bodily function news with you for one day). Would I try them again? Well, they were good. Really good. But until someone can assure me that the collateral damage can be mitigated….well….I don’t know. 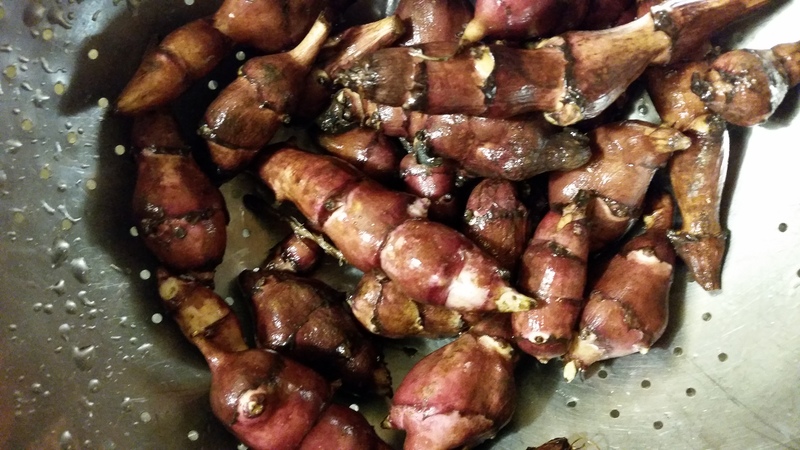 So, what follows is a delicious recipe for roasted Jerusalem fartichokes…I mean artichokes. Proceed at your own risk. They really were delicious…and I wonder wistfully whether I will ever taste them again…. Preheat oven to 350°F. Place all ingredients in a rimmed baking sheet or a baking pan and mix thoroughly. Roast for 35-35 minutes, until artichokes are tender. Sprinkle with salt and serve. Great post btw. Very funny. Thank you Conor! I was glad to have a chance to post as well. My posts have been few and far between since this crazy-busy semester started. I appreciate your visit! Natalia, you need some lateral thinking. This would be a great way to get the kids to eat their vegetables. Eating them is safer than growing them – they’ll completely take over a garden and are almost impossible to remove.